Photo posted to their Facebook page on April 12th with the following message: This morning we had a very short weather briefing and some time to get last minute rations and gear. At 12 we went out for a group snowmobile ride out to a fiord where we could see a glacier in the distance. At 90 km/hr the wind chill was a challenge, but it was well worth the effort as the scenery and adventure were amazing! Tomorrow we pack our gear and load the sleds for the final time as we load all the equipment during night for an early morning departure for the Russian polar ice cap station called Barneo. Here come the Bahamians, look out!! 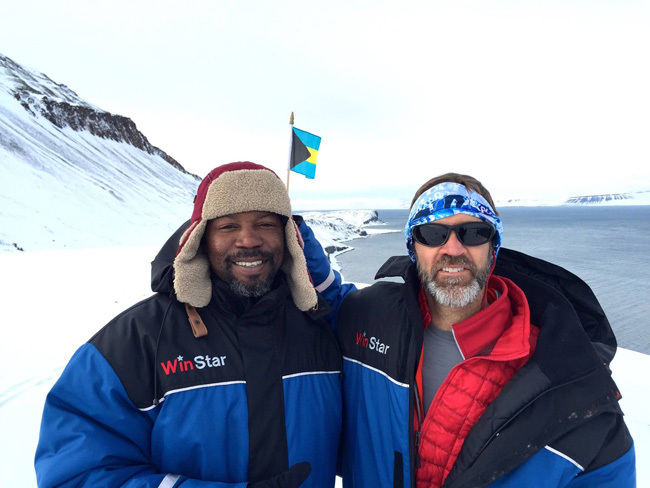 Adderley had never seen snow before the journey and the trip was a big change from Bahamian temperatures of 80 degrees. "I'm glad we have the layers and equipment," said Adderley. The duo trained for months leading up to the trip in The Bahamas, and in one of their photos visible in this Tourism Today video, you can see Roberts pulling his children sitting on a fiberglass kayak tied to his waste across a sandy beach. "The opportunity to take the Bahamian flag up to the top of the world is once in a lifetime. I am over the moon about it," said Roberts. 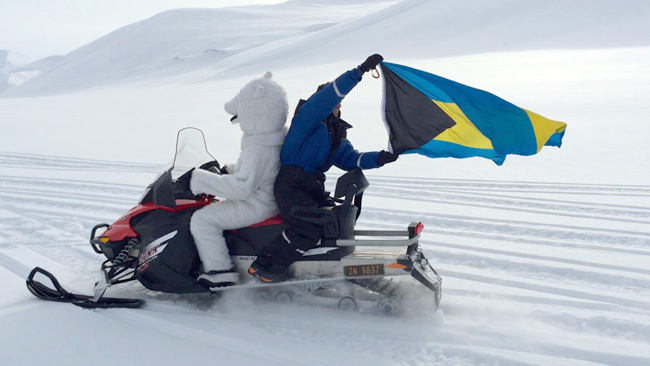 Follow the duo here on their Facebook page: Bahamas North Pole Explorers. The trip will take two weeks, and Adderley and Roberts will be the 2nd and 3rd Bahamians to have ever accomplished the task. Watch the Tourism Today video. UPDATE: The Tribune contacted the duo TODAY, April 17th and the mission was a success. The flag was planted today, and now they will begin their trek back.. LISTEN to the phone interview HERE.